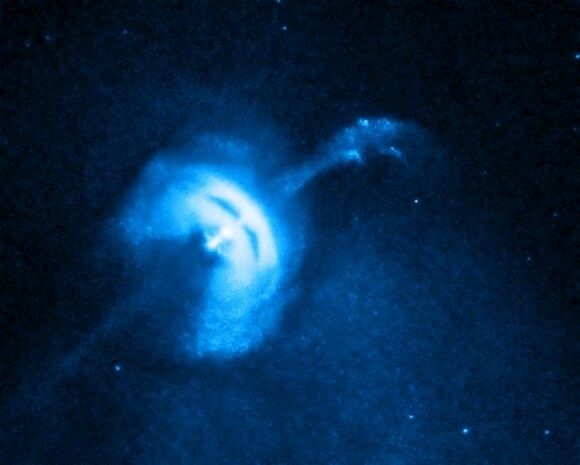 This incredible new movie of the Vela pulsar has the unnerving appearance of the Phantom of the Opera â€“ wearing not only a mask, but also a steam-blowing hat like the Tin Man in â€œThe Wizard of Oz.â€� What you are seeing here are observations from the Chandra X-ray Observatory, showing a fast moving jet of particles produced by a rapidly rotating neutron star. Scientists say these observations may provide new insight into the nature of some of the densest matter in the universe. The Vela pulsar is about 1,000 light-years from Earth, about 19 km (12 miles) in diameter, and makes a complete rotation in 89 milliseconds. As the pulsar whips around, it spews out a jet of charged particles that race along the pulsarâ€™s rotation axis at about 70 percent of the speed of light. The Chandra data used in the movie were obtained from June to September 2010, and it may suggest the pulsar may be slowly wobbling, or precessing, as it spins. The period of the precession, which is analogous to the slow wobble of a spinning top, is estimated to be about 120 days.